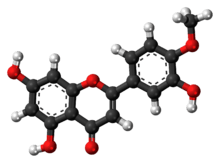 Diosmetin, also known as 5,7,3'-trihydroxy-4'-methoxyflavone, is an O-methylated flavone, a chemical compound that can be found in the Caucasian vetch. It has been found to act as a weak TrkB receptor agonist. Diosmetin is the diosmin aglycone. ↑ Jang SW, Liu X, Yepes M, Shepherd KR, Miller GW, Liu Y, Wilson WD, Xiao G, Blanchi B, Sun YE, Ye K (2010). "A selective TrkB agonist with potent neurotrophic activities by 7,8-dihydroxyflavone". Proc. Natl. Acad. Sci. U.S.A. 107 (6): 2687–92. doi:10.1073/pnas.0913572107. PMC 2823863 . PMID 20133810.